I love brain teasers so I was delighted to discover these two books. 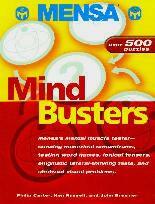 With over 500 puzzles in each book, there is ample to keep me busy. Now, let's get something straight - I don't for a second believe I am anywhere near the Mensa standard of intelligence, but there's nothing wrong with having fun while you give your brain a workout. Exercising the brain is sadly not practised enough nowadays. There are word puzzles (my favorite), diagrams to sort out, sequential puzzles, and number conundrums, my worst. At best it's frustrating and at worst, it's embarrassing. However, I do know my limits so I don't beat myself up about not being able to "see" the number puzzles like a friend, who happens to be a maths wiz, and can't understand my aversion to those kinds of puzzles. Each to their own I always say. 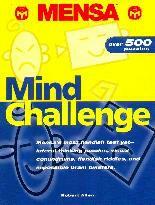 MENSA MIND BUSTERS and MENSA MIND CHALLENGE may be purchased and/or ordered through your local bookstore. Conclusion - These books make great gifts, especially to those who think they know it all - see if they really are that smart!